Your very first home, is the best investment you will ever make. This amazing value First Home Buyer Package, has everything for the young family. 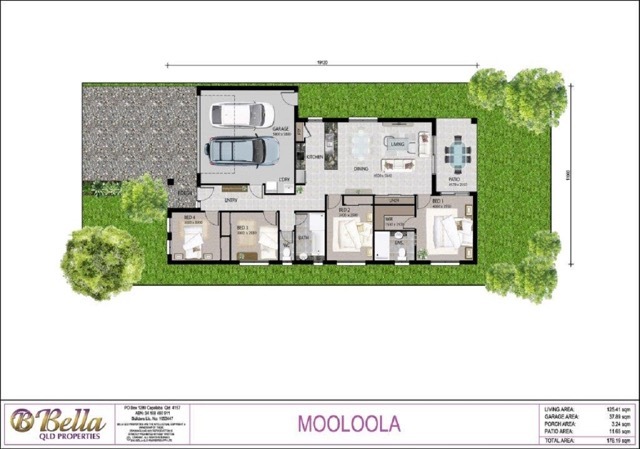 This Turnkey Package of the Mooloola by Bella Qld Properties, on a 400 m2 allotment at Flagstone City, Jimboomba, comes with our Top of the Line Prestige Inclusions Package, including Fully Ducted Air-Conditioning and is the perfect start for the first home buyer with a young family. An ideal design offering 4 bedrooms, 2 bathrooms, 2 car garage, spacious open living area and a large outdoor area, which is perfect for that Sunday barbeque and lots of space for the kids to play. Flagstone City is the Centrepiece in Peetâ€™s Flagstone masterplan. More than 1,000 families, already live in a safe and friendly environment, with convenient facilities close by, to ease the pressures of a busy routine and ensure you have time to enjoy life in your beautiful new Bella Home. There are excellent schools within walking distance, a local primary school and the state-of-the-art Flagstone State Community College with an impressive sports centre and performing arts facility. Three kindergarten and early childcare centres provide for pre-schoolers and there is a choice of other public and private schools nearby, including the prestigious, high performing Hills College. The Flagstone Village Shopping Centre is handy for essentials, with an independent supermarket and selection of convenience stores. Just minutes away, the Jimboomba Town Centre is bustling with local businesses including major supermarkets, medical-dental services, fire, ambulance and police station, a community centre and swimming pool.